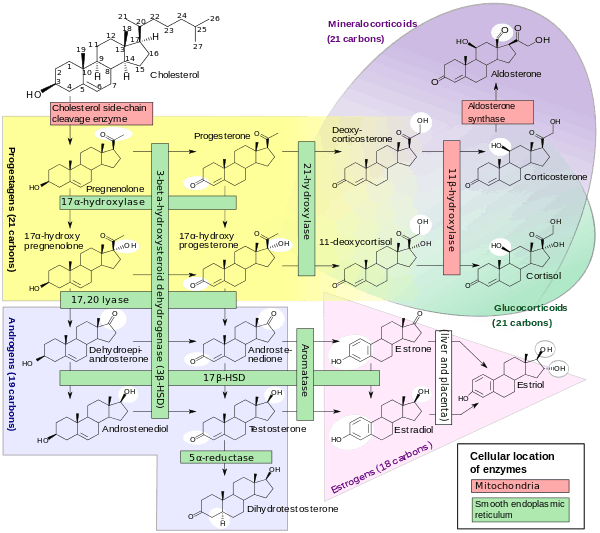 A steroidogenesis inhibitor is a type of drug which inhibits one or more enzymes involved in steroidogenesis, the biosynthesis of endogenous steroids and steroid hormones. They are similar in effect and use to antigonadotropins, which also suppress steroidogenesis, but work via a different mechanism of action. Aromatase inhibitors such as anastrozole, exemestane, aminoglutethimide, and testolactone inhibit the formation of estrogen and are used in the treatment of breast cancer, gynecomastia, and other estrogen-dependent conditions. 5α-Reductase inhibitors such as finasteride and dutasteride block the production of dihydrotestosterone from testosterone and are used in the treatment of benign prostatic hyperplasia, androgenetic alopecia, and hirsutism. However, they also prevent the formation of neurosteroids such as allopregnanolone and 3α-androstanediol and have been associated with side effects including depression, anxiety, and sexual dysfunction. 17α-Hydroxylase/17,20 lyase inhibitors such as ketoconazole, cyproterone acetate, bifluranol, and abiraterone acetate block the biosynthesis of androgens and are used in the treatment of prostate cancer and other androgen-dependent conditions. 3β-Hydroxysteroid dehydrogenase and 11β-hydroxylase inhibitors such as trilostane, metyrapone, and ketoconazole block glucocorticoid production and are used in the diagnosis and treatment of Cushing's syndrome. Cholesterol side-chain cleavage enzyme inhibitors such as aminoglutethimide and ketoconazole inhibit the formation of all steroid hormones from cholesterol and can be used for a variety of indications. Other, non-selective steroidogenesis inhibitors such as danazol and gestrinone inhibit estrogen production and are used in the treatment of endometriosis.